The Dojo is a sacred place where we train ourselves physically & mentally. The student should respect the Dojo & observe the following etiquette. (1) Always arrive punctually for training. (2) Before starting practice go to the toilet. (4) Always wear a clean white Karate Gi (Suit) in the Dojo. (5) During the class address the Instructor as “Sensei”. (6) Keep fingernails & toenails short to prevent injury to other students when training. (7) When the Instructor calls for training to begin line up smartly facing the Instructor. (10) While training listen carefully & seriously to the advice given by the Instructor. (11) Train hard to improve your own standard & do not criticise your fellow students. the lower stomach. Concentrate on your breathing & try to clear your mind. (13) All students must train at least twice a week before a grading is allowed. (15) Always keep the Dojo clean & tidy. (16) Always bow when leaving the Dojo. 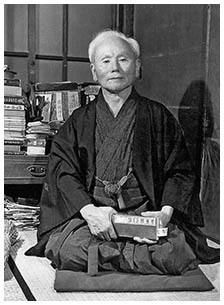 Funakoshi Sensei, The father of Modern Karate. 20 Precepts of Shotokan Karate by Sensei Funakoshi, Founder of the Shotokan style.